Drilling is a cutting process that uses a drill bit to cut or enlarge a hole of circular cross-section in solid materials. The drill bit is a rotary cutting tool, often multi point. The bit is pressed against the work piece and rotated at rates from hundreds to thousands of revolutions per minute. Drill bits are identified by the diameter size. However small size are standardised by number gauge. Number drill bit gauge sizes are analogous to, but different from, American wire gauge (AWG) and Standard Wire Gauge (SWG). Number gauge is routinely used from size "80" (the smallest) to size "1" (the largest) followed by letter gauge size "A" (the smallest) to size "Z" (the Largest). Number gauge is actually defined at least down to size 107, but these smaller sizes are rarely encountered. 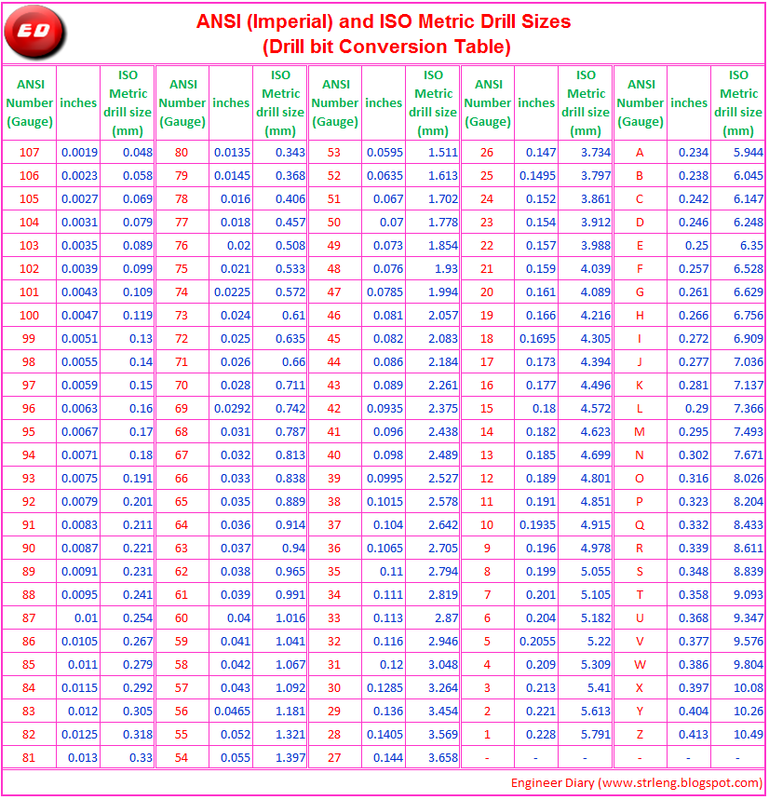 Drill bit conversion table is given above, click to view enlarge. The table gives set of three columns for five times. The First Column gives the ANSI number or Letter drill size, the Second Column gives the size in inches and Third Column gives the closet available ISO Metric drill size. Number and Letter gauge drill bits are almost always twist drill bits and it is the most commonly used. The gauge to diameter conversion does not follow a set formula, but rather was defined as a useful and practical measure.